Thread: St. Qubeslick 2019 Is Here! Take on eight new event adventures that give a glimpse into the new and improved gardening system coming to Trove later this year. Opening dungeon loot chests during the event grants Lucky Dust that can be used to craft Clover Seeds and Lucky Stars at the Wheel of Seasons bench. Plant your Clover Seeds and use your leet gardening skills to help them grow. Once these plants reach a crucial stage of development, you can toss Lucky Stars at them to imbue them with luck! Clovers that are imbued with enough luck with grow into Lucky Clovers; a new consumable item that boosts Magic Find by 50 for 1 hour. 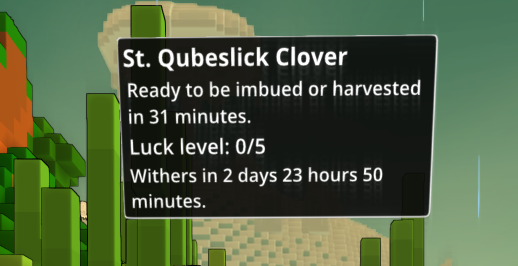 St. Qubeslick 2019 may be here for a short period of time, but stockpile enough Lucky Clovers and fortune will ever be in your favor. Nice. Very Green. Much Enjoyable. 9/10 No Leprechauns. Edit: Can these stack, cause I need more Magic Find cause I can't get Crystal 3 gear for my life. MF only helps with Crystal Drops not the level it drops. I have had over 7K MF and didn't get any C3 drops at times. Well guess I'm not getting at crystal 3 gear lol. This event is the fruit of lazy developers. No new items as event rewards. The lack of insta-growers being able to reset the maturation time-gate is disgusting. I guess we'll just have to wait for the ally plant and tome plants to determine if the gardening rework is beneficial to players and worth the investment of their time. I hope not all plant/growth reagents are non-tradeable as we need to encourage more player trading. This one in particular, Lucky dust, is excusable to be untradeable as it is readily available through normal play via dungeon completion. But I swear, if I have to farm 100-300 *type of enemy* to get the reagents to craft and boost a given plant that will die in 3 days, I'll totally skip it. stockpile enough Lucky Clovers and fortune will ever be in your favor. That picture shows almost 4000 dungeon's worth of dust and 220k flux.. Would a new player using only these 50 mf buff's + the base 50 mf be able to make that back before they use all 196 of them? I would agree with some of the previous statements that the Lucky Clovers are not worth the 6000 flux and effort as a gardening reward. I wouldn't recommend it to anyone except to finish the quest line. As a preview of gardening I do have concerns about the withering of the plants and time required in gardening and would only recommend it in game if the rewards are worth it. Worthwhile rewards could be: crystalline cores, bound brilliance, binding darkness, gem augments, emp. gem boxes, despoiled divinity, lunar souls, i.e. things that are currently most in demand and/or time gated. Otherwise I don't think anyone would bother with the new gardening system at all. What I'd like to know is what happened to the seasonal pinatas in the store this year? We should have had the valentines day ones and right now there should be the shamrock ones along with the winter ones. So far, all we have are the winter ones. Its depressing. Under mastery 20? Want a free class coin? Use code:XYN66FMGFTRYXZWCCFQT from the glyph launcher, under "redeem code" OR go to: https://trovelive.trionworlds.com and login, under "account" go to "apply code"
Didn't know you have to wait another hour after 5/5 imbue. Mine ended up getting destroyed cause I didn't wait another hour to harvest it. I thought imbuing it just enhances the item to be better, not "oh you have to completely imbue it to get an item out of it," or it'll end up getting destroyed even with all the effort you put into it. I mean once I completed the 5/8 quest and went to 6/8 I thought it was okay to harvest it. GG.